Ferrari's Fernando Alonso is under "real pressure" after seeing his championship lead slashed at the Japanese Grand Prix, McLaren say. Red Bull's Sebastian Vettel closed to four points behind Alonso after winning in Suzuka on Sunday while Alonso retired. McLaren's Lewis Hamilton is 42 behind. "Fernando is under some real pressure, more pressure frankly from Sebastian than us," said McLaren boss Martin Whitmarsh. "But nonetheless we have closed the gap and we have five races to go." Alonso spun out at the first corner with a puncture caused by the front wing of Kimi Raikkonen's Lotus tagging his left rear wheel as they jostled on the way to the first corner. The incident followed a troubled qualifying session for Alonso, who ended up sixth on the grid after being forced to slow down on his flying lap because of caution flags being waved after a spin by Raikkonen. 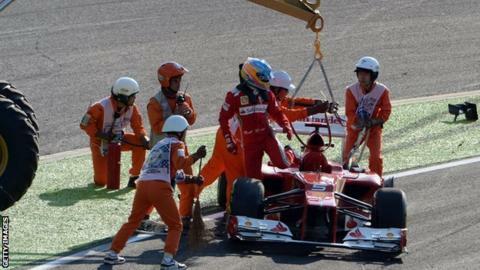 Ferrari team boss Stefano Domenicali said: "For sure we are living in this moment the frustration of what happened. But we have to stay calm and react. "We know every race is different and what has happened to us can happen to the others. "The most important thing is to stay really rational and not fall into what is the worst enemy of the team, what the others are trying to put on us, which is pressure. "It is a very important point of the season, and we have the opportunity to react straight away next Sunday in Korea." Ferrari have admitted that the development of their car is being affected by problems with their wind-tunnel, with results from their simulations of new parts not correlating with those when the upgrades are tried on track. Red Bull, by contrast, have introduced a series of developments that have solved early-season problems, and now appear to have the car to beat. Alonso said on Spanish television after the Japanese race that the Ferrari he was driving in Suzuka was the same car he had six races ago. Domenicali said: "You have to understand the frustration of Fernando after this weekend. "The car is not the same as six races ago otherwise we would be much further behind as the development rate of all the teams is very high. "The reality is we stay focused on what we are doing because we have the luxury of not wasting too much time because in five days' time we are at another track and we can be strong there." Asked if Ferrari were losing the 'development race', Domenicali said: "I don't know. We saw McLaren with unbelievable pace in Singapore, everyone was saying they are flying and we didn't see that situation this weekend. "This weekend for sure Red Bull was impressive. So we need to see what we can do to match their development, or if this track was better for them, I don't know. "But we need to make sure we are keeping the same kind of positive pressure on our engineers to make sure we deliver the development." Red Bull team boss Christian Horner believes this year's championship is now a two-horse race between Alonso and Vettel. He said: "We need to keep trying to get performance out of the car, and the championship now is effectively a battle of five races between Fernando and Sebastian. "You can't rule out the others but whoever does the best job over the next five races will ultimately prevail." McLaren also had a difficult weekend in Japan, with Hamilton finishing fifth, one place behind team-mate Jenson Button. Whitmarsh said: "It was not the most sterling performance from us. "In those situations you've got to go back and look at what you're doing on the car and get it as good as you can in Korea. "Both guys are capable of winning races and we have five races left to have a go at."